Discussion in 'News & Current Events' started by HankD, Apr 15, 2019. I visited there in 1981 when I was stationed at RAF Chicksands in England. I still remember the gargoyles. It seems now the entire structure may be a total loss. So far the report is that no lives were lost. The church itself is a monument of beauty surviving close to a millennia as well as a housing place of a priceless collection of works of art. "Notre Dame was constructed in 1163 during the reign of King Louis VII and was completed in 1345. The cathedral is a worldwide Parisian icon and site of some of the most important moments in the history of France. Henry VI of England was crowned inside the cathedral in 1431 and Napoleon Bonaparte was crowned Emperor of France inside the cathedral in 1804. The cathedral receives 12 to 13 million visitors a year and is home to countless paintings, sculptures and other priceless works of art. James Shepherd, director of preservation and facilities at the Washington National Cathedral, spoke with CBSN on Monday." 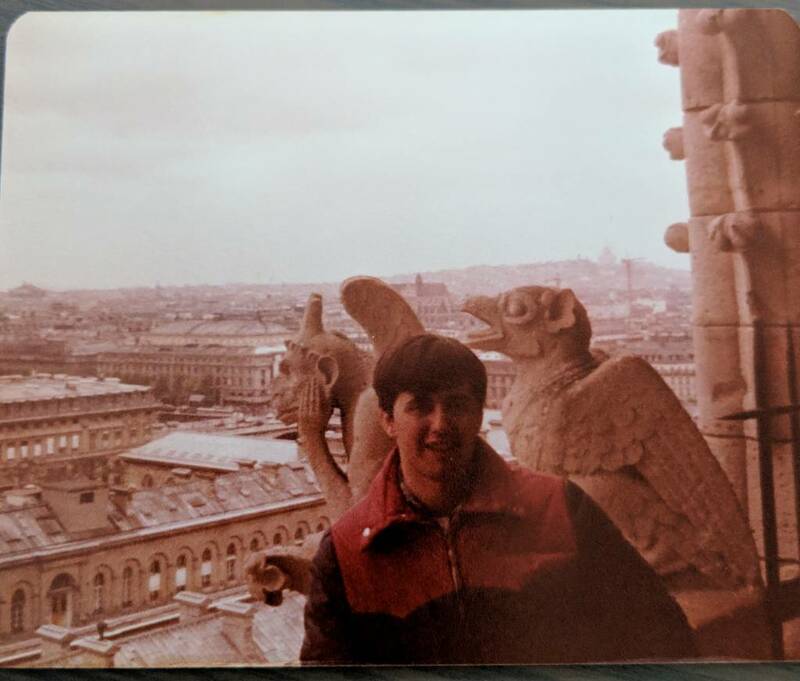 Me in April 1981 at Notre Dame with the famous gargoyles in the background. It is a sad historical loss for sure. I enjoyed the area and seeing the cathedral. In the end it is only a building, but it is a sad cultural loss. Actually it is not correct to say that Napolean was crowned there. He asked the pope if it was good for the most important man in the world should crown him. The Pope beamed and agred, so Napolean took thre crown from the hand of the pope and crowned himself. Macron is starting and international fund to rebuild it. Was this arson or terrorism and how did it get out of hand? Maybe The Vatican Bank will pay for a new building. I wouldn't hold your breath waiting for the Vatican Bank to pay. They are more interested in grabbing money. The île de la cité is the original part of Paris and was originally a fishing village, I am told. Actually it is not correct to say that Napoleon was crowned there. Its a quote from CBS News from the URL I posted - Don't know where they get their facts. By the same token David how do we know if what you say about Napoleon is not just an historic urban legend - you know kind of like "Let them eat cake"? They think it was actually the renovation crew. But the investigation is just starting. Even if you rebuild it, it wouldn't be the same. I am sure that Macron will link this to climate change. Was this arson or terrorism and how did it get out of hand? Not Amy Christians left in France anyway. Not many Christians left in France anyway. Protestants (known as Hugenots) were largely expelled from France by Louis XIV in 1685 through the revocation of the Edict of Nantes which had guaranteed rights to Protestants. There is, however, something of a resurgence of evangelical Christianity in France, though from an exceedingly low base. Islam is on the march to conquer the world. I notice your link mentions mental illness. They often add unemployment (American State Department) and climate change. Liberals believe that they were born good but constrained by society. My house is only a building. The Wal-Mart across the street is only a building. Notre Dame is premiere example of Gothic architecture, a repository of exceptional workmanship and ingenuity and artistic achievement and a treasure trove of eight centuries of French and Western European history. My house is far more important to me than was Notre Dame. But I was thinking of Ozymandias. It was only a building...a man made structure. I wonder how many would have seen it less a tragedy had men died yet the cathedral been spared. We live in a world of skewed priority. While its burning is sad, ultimately it was only a building..a temporary structure.